Can Earth Hour Galvanize the Global Warming Fight? Every successful social movement has its defining images. Think of the civil rights movement, and the photos of protesters being attacked by police dogs and pummeled by high-pressure fire hoses. Or the Vietnam anti-war movement, and the video of body bags being beamed back to America's living rooms. Even environmentalism has its iconic images, like Cleveland's heavily polluted Cuyahoga River catching fire in the 1960s, smog wreathing Los Angeles's skyline during the next decade and even the stark hole in the ozone over Antarctica. To help galvanize public support  especially around a complex issue  the right picture really can be worth a thousand words. When it comes to climate change, however, that picture hasn't yet been found. Hurricane Katrina's destruction, drowning polar bears, spreading deserts  these images are powerful in their own right, but they're not the sorts of pictures that can drive a movement. Precisely because global warming is so, well, global, potentially touching just about every corner of the world and every aspect of our lives, encapsulating it in a single image has proven elusive. You can't connect climate change to a natural disaster as simply as you can connect a napalm bomb, a running child and the war in Vietnam. That's made building and sustaining a movement against global warming so challenging. We can't see it yet, not quite  and we can't see its victims. But by the time we can, it will be too late. This is the second year in a row that WWF has helped run a worldwide Earth Hour  the event began two years ago just in Australia) -- and participation has grown tremendously, from 400 cities in 2008 to some 4,000 this year. The image, at least, will be spectacular  monuments and skyscrapers switching off, a ring of darkness passing across the face of the planet. Though WWF is loosely overseeing Earth Hour, the protest  for lack of a better term  is a product of the age of social media, organized at the grassroots, with word spreading via Twitter and Facebook. "This is an open source thing," says WWF spokesperson Leslie Aun. "We lit the spark, but everyone is owning this." Is Earth Hour going to become such a tipping point, or the movement's defining image? It's possible, but as important as pictures are, we'll need more. When President George W. Bush was in charge, knocking away climate change action like an NHL goalie, symbolism mattered because it was all we had. Now there's a new President who has made very green promises, and who needs to be kept to them, even in the teeth of the worst economic crisis most of us have ever known. The new battle will be fought in the nitty gritty of policy, and the protests that matter will be political ones. Global warming may never get its perfect picture  Earth Hour, a globe gone dark, may be the closest thing we'll have. That's all right  at a time when a recent Gallup poll reports that a record-high 41% of Americans think global warming is exaggerated, green groups need to do everything they can to keep this issue on the front burner, here and in the rest of the world. "The take home message from Earth Hour should be that we are not alone," says Roberts. "I want people to go to the website, but after, I want them to send a letter to their congressman." 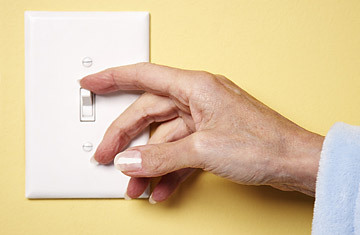 So think of it this way; turning off your lights Saturday night is all well and good  but remember that the work really starts when you turn them back on.